If Chappie has the same look and feel as District 9, it’s because both movies have the same director (Neill Blomkamp) and same creative team. Both are science fiction stories set in and around Johannesburg, South Africa. Both have a gritty, grungy look to them (unlike similar American movies that have a slick, over-produced look). Some of the same actors (with difficult-to-understand accents) appear in both movies. The non-American actor Sharlto Copley, who played the lead in District 9, also plays the lead in Chappie, but he’s unidentifiable because he’s a robot. In Chappie, the robot officers used by the Johannesburg police force are highly effective in fighting crime. The whiz who developed the robots, Deon Wilson (played by Dev Patel), believes he can take the robots another step—he can make them think and feel, just like humans, but without human failings. It’s a no-go, though. His employers won’t let him do it. When a group of thugs (led by the ultra-strange Ninja and Yolandi, with the most exotic hairdos you’ve ever seen) hear about the robot technology, they hatch a plot to use it to their own evil ends. When Deon Wilson is on his way home with one of the robots in his van that’s damaged beyond repair, the thugs intercept him, take him to their lair, beat him up, and force him to work on the damaged robot so they can use it to commit crimes. 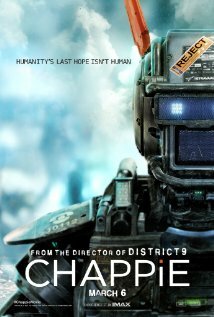 The result is Chappie, a shy (at first) machine with human thoughts, feelings and emotions. It seems that Yolandi isn’t quite as creepy as we first thought. She becomes a sort of mother figure to Chappie and helps him adapt to the world. Ninja, though, is all bad (not to mention gross and despicable). He mistreats Chappie and forces him to be a criminal like himself, much to the dismay of Chappie’s maker, Deon Wilson. The emotional core of the movie is Chappie’s relationship with Deon Wilson and with Yolandi, whom he calls “mommy.” She is protective of him (he needs to be protected from the evils of the world) and decides at some point that he is more important as a being that she can love than as an instrument for perpetrating criminal acts. I suppose it could be said that Chappie brings out the mother instinct in her. Of course, there always has to be villain (as if Ninja isn’t enough of one). The villain here is Hugh Jackman (speaking in his native Australian accent). He is bent on destroying Chappie and making sure the “thinking/feeling” technology of robots doesn’t go any farther. (I think I must have missed what is motivation is.) The Hugh Jackman character seems unnecessary and adds to the cluttered feel of the movie. But, then, if it hadn’t been for him, there wouldn’t have been the dramatic conclusion that opens the way for a possible sequel. Posted in Uncategorized and tagged Allen Kopp, capsule movie review, Chappie. Bookmark the permalink.